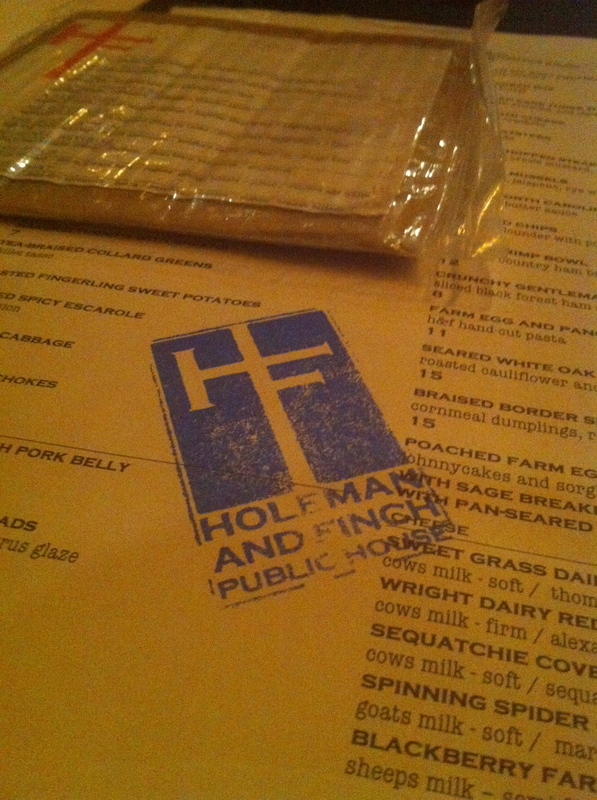 A few nights ago, Katruska and I had plans with the lovely Mistress of Soup (aka Jenny Levison of Souper Jenny) to make a return visit to one of our favorite places in town, Holeman & Finch. Although we had previously enjoyed their great food and libations, we had not taken the opportunity to really focus on the outstanding cocktail menu created by Greg Best. So armed with a adventurous spirit, we set out to see how far we could explore into the depths of the menu and the minds of the bar staff. The Mistress of Soup was first to arrive, so she claimed our places at the bar. While waiting for us, she launched right in with her first selection, the Sacred Oath (Whipper Snapper Oregon whiskey, Cocchi Americano, Canton ginger liqueur, and lemon juice). This is a light and refreshing drink with delicate herb and wood from the whiskey and Cocchi Americano and warmth and acidity from the Canton and lemon. Since Katruska and I were running late, we had to sample the Mistresses second round of the Sacred Oath. I feel fairly sure, there were a few other not-so-sacred oaths thrown our way before we arrived. Now comfortably ensconced at the bar, we began our research in earnest. Katruska started with a Kilted Pistolero (Cazadores blanco tequila, Drambuie, Angostura bitters, and citrus juices) and I selected a Squirrel Reviver (Purkhart pear williams brandy, Galliano, Dolin blanc vermouth, and grapefruit juice). The Kilted Pistolero was recently in Imbibe magazine as featured cocktail and after one sip, you will see why. 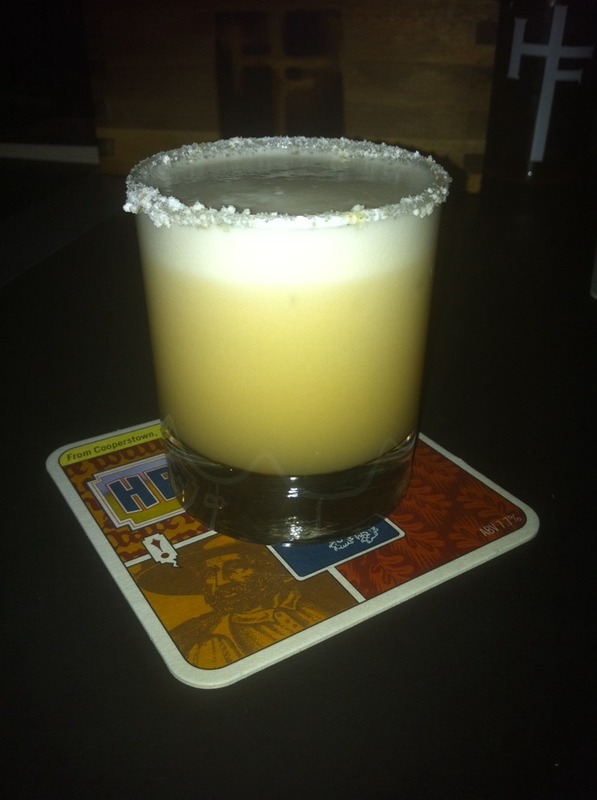 Its blend of citrus juices cuts the sweetness of the Drambuie while the tequila provides nice edge. 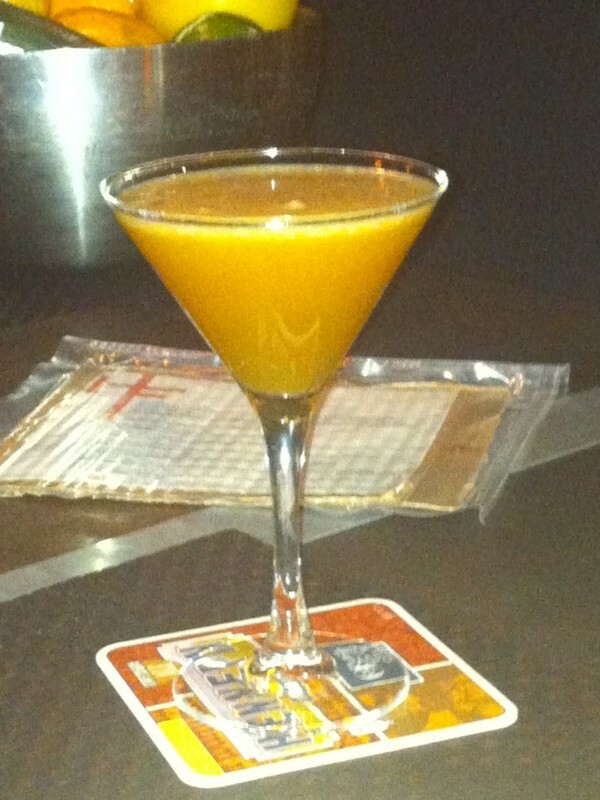 The drink was lovely and was one of Katruska’s favorites of the night. On the other hand, she found the Squirrel Reviver (a playful take on the classic Corpse Reviver) to be entirely too sweet for her. I enjoyed the sweetness of the pear brandy against the herb of the Galliano and acidity of the grapefruit. I will definitely be making a home version these over the next couple of months. We decided at this point, to order several dishes to share before proceeding further into the cocktail menu. After ordering a few items (by this I mean way too many) off their excellent main menu, the Mistress of Soup opted to get a drink for us to share while we waited on our food. 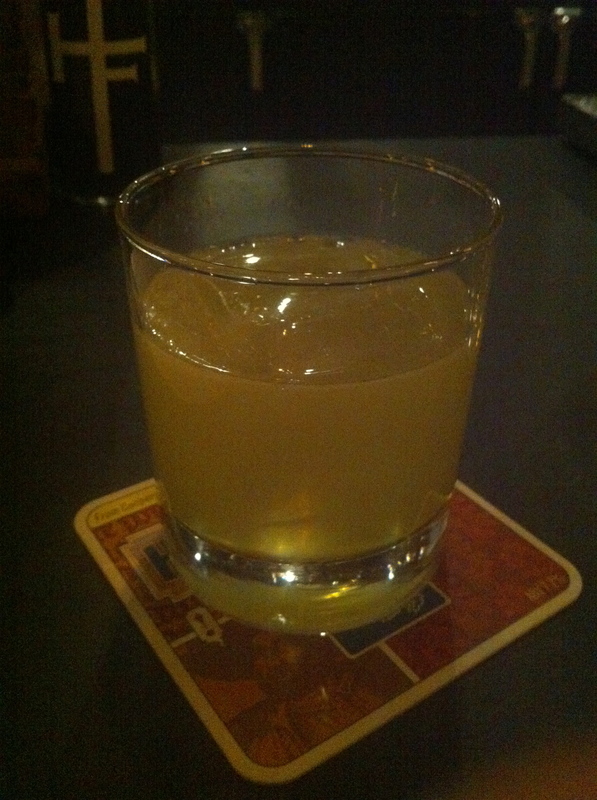 And thus, the Pig-Pik Sour (Johnny Drum bourbon, Marie Brizard apry, Regans’ orange bitters, lemon, and smoked egg white) was delivered into our presence. I mention this with reverence because this one was by far my favorite of the evening. The glass was rimmed with freeze-dried bacon and brown sugar and the libation in the glass is an amazing combination of smoke, apricot, and the unmistakable flavor of bourbon. This is a concoction that Katruska and I loved, but was not liked at all by the Mistress of Soup. Oh well, you can’t please everyone. The next several drinks resulted from us going off menu. I highly recommend asking your bartender about what they like in a drink and see what happens. When Katruska mentioned her taste preference for cocktails that are on the bitter and strong end of the spectrum and wondered what he would recommend, she was given a Season of the Witch (Bluecoat American dry gin, Punt e Mes, Strega, grapefuit juice, and freshly pressed ginger). This cocktail was on an earlier Holeman & Finch cocktail menu and is great with a definite strong edge from the gin, but everything else was balanced out from the remaining ingredients. I mentioned that I didn’t see any shrubs on this version of their menu and was told that they could still make an Orange-Clove Shrub for me. I loved this one and it was the Mistress of Soup’s favorite of the evening. Unfortunately, I didn’t record all of it’s ingredients, but I can tell you that it had a shrub of oranges, cloves, sugar, and vinegar and was mixed with ginger beer and other ingredients. I assure you I will be finding out all the components on my next trip. Finally, the Mistress of Soup asking our bartender his favorite drink and was given his version of an Old-Fashioned (Michener’s rye whiskey, Angostura bitters, sugar, and orange twist). Katruska and I love these and this was take on the classic that was toward our flavor profile of strong with a bit of a bitter edge coming from the rye. As both Katruska and the Mistress of Soup finished their drinks and our dinner plates were cleared, I decided to try one more libation and selected a Belle Starr (H&F infused grain spirit, Disaronno amaretto, Luxardo bitter, brut sparkling wine, and lemon juice). 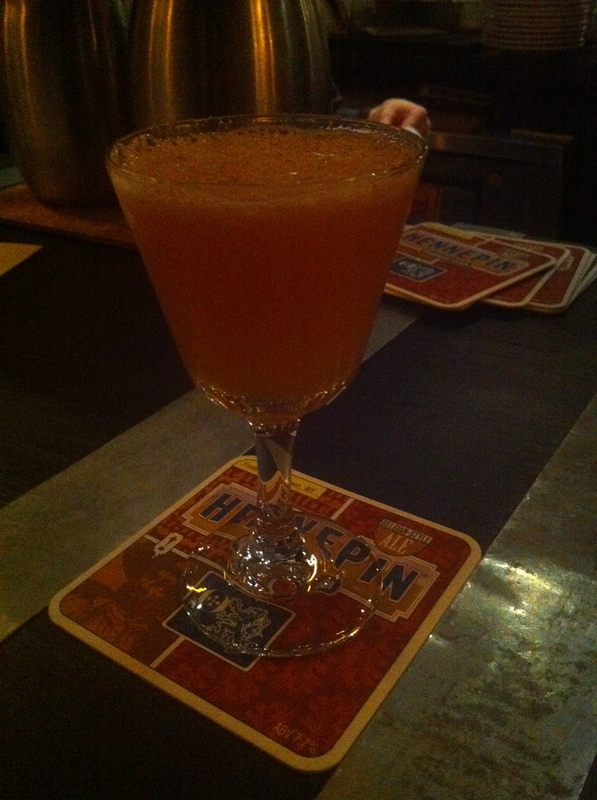 While this concoction may have looked like a Bellini, it was far from it. 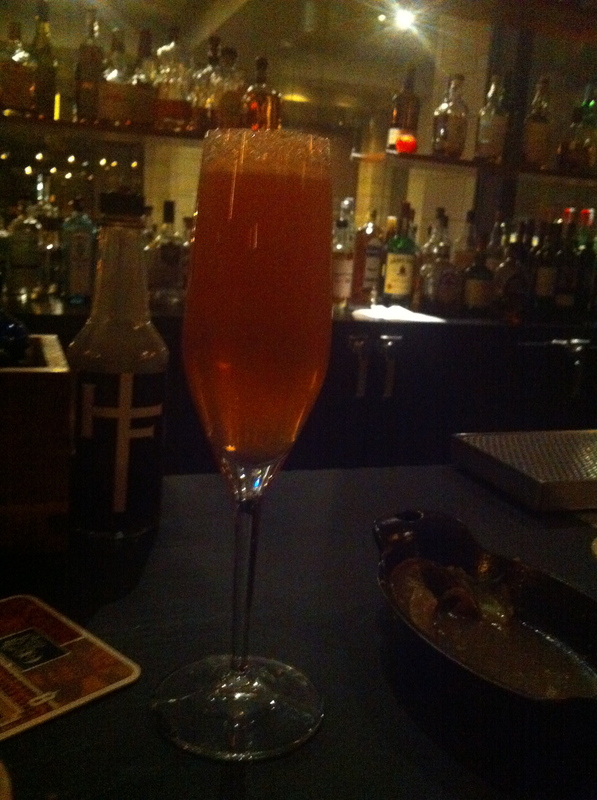 It was a very dry drink that reminded me of a high quality blush champagne with hints of apricot and orange. Ending with this cocktail was an excellent way to close out the evening as it served as a digestive to all that had come before it. Atlanta has many good places to eat and enjoy a beverage, but few come close to the great experience at Holeman & Finch. I can’t wait until my next visit. Until next time, cheers! Omfg, thanks so much for posting this! It is gonna aid me when I buy Brut Sparkling at the grocery store! Impressive! However, you don’t get the point if the enemy also has your flag. numbers over 200 to experience large-scale wars on the screen at one time. fighting for the White Gold Tower through Pv – P to become the Emperor.